This is one of those recipes that you can't really write a recipe for because it's all about what you have on hand. Naturally, My Man would go with him as often as school would allow, and he remembers eating this. It is one of his favorite memories of his dad, and he asks for it a lot, especially on chilly fall days. The original "recipe" was cooked in a big dutch oven over a campfire, so that probably added just a touch more flavour to it than cooking it on a stovetop. Pasta - use whatever you have on hand. Poppa used elbow macaroni, and I usually do as well, but I have used other pasta shapes if elbow isn't on hand. Some that I have used are bows, penne, rigatoni and shells.All work great! Cook the pasta according to pkg directions and drain well when done. Set aside. Brown the meat in a dutch oven until no longer pink. I toss in a couple of chopped onions (1 is good if that's all you have), about a tablespoon (more or less) minced garlic and up to a cup of chopped celery, and 2 large carrots, grated. When the onions and celery are softened, add the pasta to the meat/veggie mixture in the dutch oven. Clean out your fridge of any leftover veggies or add whatever your family likes. My Man doesn't like a whole lot of veggies, so this is a recipe where I can sneak in whatever I can by grating them up. I have added grated zucchini, a bit of grated parsnip, etc. I add finely chopped green, red, orange and yellow peppers to the mix as well, if I have them in the fridge. My Man does like mushrooms, so I toss those in, canned if I don't have fresh. You can use whatever you have. Use up those partial bags of frozen mixed veggies if that's what you have. Once you get all that mixed together, you can gauge how much tomato sauce you need to add to bind it all together. I use just regular tomato sauce. I have often run short of enough tomato sauce and have added a can of tomato soup, or a can of diced tomatoes, stewed tomatoes - I have even added a bit of tomato juice if needed. Again, mix all this together and then add whatever herbs you have. I add a couple splashes of Worcestershire sauce, basil, and oregano. If I have thyme, rosemary and tarragon, I use those. Add to your taste. I don't add salt or pepper, because My Man is on a salt restricted diet and he doesn't like pepper. I love pepper and so I just add it on my serving at the table. Heat to bubbling and simmer, covered, until whatever veggies you added are cooked through. I have been known to toss it all together in my roaster and pop it into the oven (325 degrees F) for a couple of hours, stirring often. There you have it. 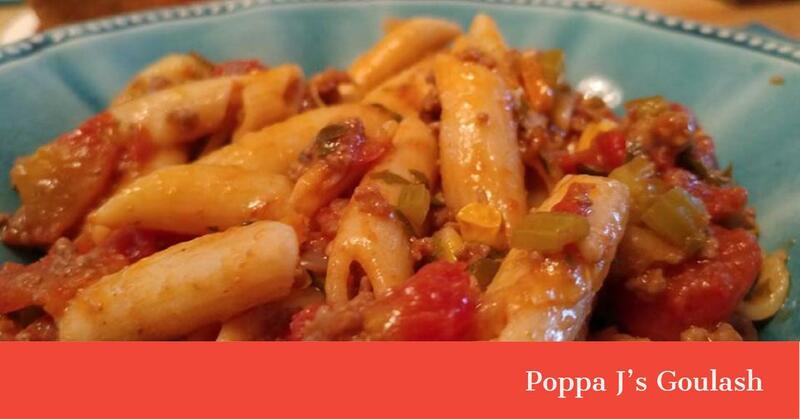 Poppa J's Goulash. Add crusty rolls and a tossed salad for a hearty meal on a cold day!